OVERVIEW: This book is based on the ideas of the American cartoonist, sculptor, author, engineer, and inventor Rube Goldberg. 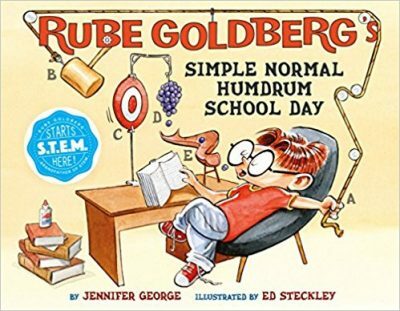 DESCRIPTION FROM THE PUBLISHER: If Rube’s inventions are any indication, “normal” means something very different in the Goldberg household. For Rube, up is down, in is out, and the simplest path to accomplishing an everyday task—like brushing his teeth or getting dressed—is a humorously complicated one. Follow Rube as he sets out on a typical school day, overcomplicating each and every step from the time he wakes up in the morning until the time he goes to bed at night. This book features fourteen inventions, each depicting an interactive sequence whose purpose is to help Rube accomplish mundane daily tasks: a simple way to get ready for school, to make breakfast, to do his homework, and so much more.